Click on the link below to check out Room 21’s Learning Hub! Here you can see everything we are learning in Room 21 this term and it also has links to our Blogs. Enjoy! The Barfoot & Thompson Young Authors Challenge is back for another year of great stories, and this year the theme is heroes. Now in its seventh year, the short story competition gives students the chance to become real-life published authors. All proceeds of the book go the Starship Foundation. The Young Authors Challenge is the perfect opportunity for teachers and parents to inspire children (either individually or as a class) and develop their creativity and literacy skills. The competition awards up to eight budding writers, or classroom, with the chance to be published authors in the 2014 Storybook. Experienced author John Parker will work with the children whose stories are selected, and they’ll have illustrations drawn by real-life heroes, including rugby star Keven Mealamu. With all the proceeds from the finished book going to the Starship Foundation, the Young Authors Challenge is a celebration of imagination, storytelling, and the magic of reading. This would be a great challenge for your child to complete and if your child would like to enter they can by providing their teacher with their piece of writing and they can enter for your child or they can enter online by visiting the above site. 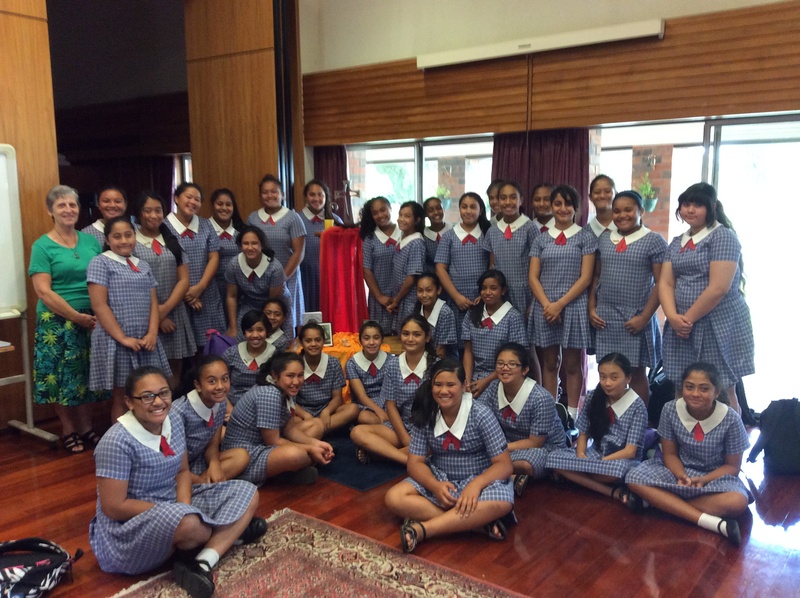 Mildred Lipa, Regina Lemanu, Denise Levae, Devyani Patel, Katerina Vaoga, Charlotte William and Francessca Wong Tung. “Attitude, Commitment, and Service” – Rangimarie’s mantra. In our syndicate we live by these values, as well as the school values, Service, Reconciliation, Compassion, and Human Dignity. To be a lifelong learner, we must have a positive attitude, not only to our school work, but in everything we do. As you all know we have a number of extra curricular activities. Each student is able to join these activities, but must stay committed, and make the effort to attend all practices, and participate to the best of their ability. When we enter the Rangimarie Syndicate, we become role models for the rest of the school. The School, Board of Trustees, The Church Community, and other schools, have high expectations of us as the big sisters of Holy Cross. All our camps, sports activities, music activities, and all the other extra-curricular activities, are subsidised by the BOT. Therefore we should give back by serving the school with pride and participating to the full. Once again welcome, and we wish everyone a successful and happy year. This term, we are wearing our summer uniform which can be purchased from the school office. In our syndicate the girls are allowed to wear white ankle socks (not sports, heel hugging socks) with black leather school shoes (not canvas shoes). uniform at school everyday as we do fitness daily. Our classes have been set up as e-Learning environments. Each room has 12 computers and ipads to enable students to be self managing learners. Your daughter has been given a Digital Citizenship Agreement to be completed with you, as it is very important for her to be aware of Cyber safety. Our theme for the term is “God is Creator”. Music: Music Theory – Writing and Composition, Playing and Singing, Percussion Instruments- Xylophone, Drums etc. Some more creations from our talented Senior Students!